National dialogues operate outside the permanent institutions of government; moving beyond the Westminster bubble to listen to the communities who feel disconnected from government. 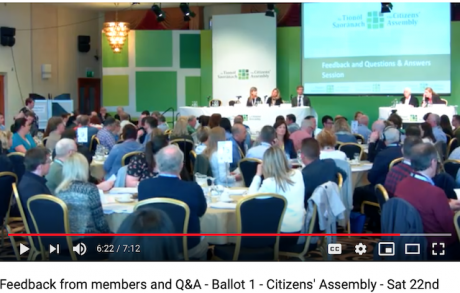 Sceenshot: Citizens Assembly of Ireland, YouTube. April, 2017. Brexit has morphed into a messy divorce that has exposed not only deep political divides but competing visions of Britain and what they should look like. Whatever the political outcome, the referendum has laid bare a fractured country, where the problems are deeper than the issues of Brexit and speak to nations divided about their identity and future priorities. In this febrile atmosphere, is there a place for national dialogue? In Britain this dialogue could be used as a preventative tool, to navigate away from our current poisonous atmosphere, enshrining dialogue as part of the political culture. Convened in the spirit of reconciliation, it could provide an opportunity to bridge our deep fault lines and diffuse our shrill debate; going beyond the current political divides, to deeper conversations relating to how we should live, how resources should be allocated and what the nature of tolerance and pluralism should look like in the twenty-first century. Across the UK, anxiety looms; most recently, this insecurity was devastatingly expressed by the governing classes when Theresa May’s Brexit plans experienced the worst parliamentary defeat in living memory. This unravelling of the political class is by no means exclusive to Britain; indeed, it has become symptomatic of democracies once idealised on a virtuous pedestal. In France the gilets jaunes protests have paralysed French politics and President Macron has called for a grand national debate; while in the US, the polarised recriminations surrounding the building of a wall on the Mexican border have led to a government shutdown. Politics must recognise that its own continually shifting landscape is exacerbating people’s anxiety. And so a more modern politics is required; one that better connects the government to the people. Those who voted to leave the EU did so for many reasons and from all walks of life, but many came from the poorer regions of Britain. There is a striking disconnect between the government and the people: many who voted felt they were not being heard, and angry hinterlands spoke to a deep sense of marginalisation that had been exacerbated by economic policies of austerity. The UN rapporteur Phillip Alston’s critical report on poverty was clear, ‘British compassion for those who are suffering has been replaced by a punitive, mean-spirited and callous approach’. Moreover, according to the report, the most vulnerable and disadvantaged members of society will take the biggest hit from Brexit. Poverty cannot be ignored; to leave it unaddressed can only exacerbate resentment between different social groups. But the picture is complex and there are multiple sources of discontent amongst those who voted for Brexit. Whilst poverty is undoubtedly on the rise, some corners of Britain are richer and more comfortable and supposedly more connected than at any time in human history. Something more profound is happening where individuals are feeling more isolated, adrift and purposeless than ever before. Our societies are continually in flux; they breed creativity but at the same time they are acutely vulnerable to disruption. The bonds that held us together, be it the infrastructure of religion or the generational support within families, are fast eroding. Socia media promised new forms of community and connectivity, and yet, paradoxically, it seems to have fostered distance; exploiting our differences and breeding superficial relationships, devoid of intimacy. National dialogues are becoming an increasingly popular tool for conflict resolution and political transformation in broadening the debate about a country’s trajectory beyond the usual group of elite decision-makers. A key strength of national dialogues is that they operate outside the permanent institutions of government; the dialogue would seek to move beyond the Westminster bubble and listen to the communities who feel disconnected from government. The dialogue may be most effective if it were to be convened by a respected institution, such as the Joseph Rowntree Foundation. Rowntree would be a relevant home for such a dialogue as it has had a reputation as a force for social good throughout the twentieth century, and may well correlate in people’s minds with values of fairness, equality, community and reform. Its legacy continues to resonate today. This Quaker family had a huge impact on social reform and justice and was a major influence on shifting our focus and understanding to the root causes of poverty and not just the treatment of its immediate symptoms. As a radical and visionary, Rowntree introduced an eight-hour day in 1896, a pension scheme in 1906 and a 44-hour working week and works councils in 1919. Rowntree had a profound impact on shaping social policy in the early twentieth century; and it is clear that, more than 100 years later, this kind of creativity is once again required. National dialogues would provide the space for such creativity and the consultation process may well propel new versions of such radical enlightened thinking. The Archbishop of Canterbury Justine Welby may also be helpful in terms of setting the climate for a national dialogue. He has urged the country to start 2019 in a ‘new spirit of openness towards each other’ and attempt to overcome the struggles and divisions of recent years. Importantly, the religiously diverse nature of the UK today would need to be reflected; involving voices from Rabbinic leadership and senior Imams in the Muslim community. But a secular voice will also be important and there could be a role for public figures who speak to large groups of people with cultural capital, who themselves could showcase a model dialogue process. Public engagement would likely adopt a mixed-methods approach, involving online and in-person dialogues, perhaps housed in town halls and community centres. Careful consideration would need to be given to those chairing the in-person dialogues. These should not be led by the usual ‘great and the good’, but those who are rich in a new form of power: those who are respected and trusted by the diverse membership of their community. To help elicit a collaborative dialogue, as opposed to a more oppositional debate, specialist training may need to be carried out: there is a need to break down the posturing, pervasive in too many of our current sterile conversations, to encourage communication hallmarked by more genuine listening. While it may not be the government who leads on delivering national dialogue, it has a responsibility to support the conversation and act on its recommendations. Practical ideas and their implementation would be the ultimate objective, with an overarching question of ‘what would improve community relations and what would create a strong sense of social cohesion?’ In the short-term, this must speak to the immediate divides uncovered by Brexit and in the long-term, this must look to building a more cohesive society. A structural shift is necessary, but there is also a need for deeper transformation: a shift in mind-sets, where individuals are personally invested in their community. A coherent vision is needed that speaks to three decades of change, globalisation and automation. It will require the kind of creativity that crosses party lines and comes up with new and imaginative solutions that address not only structural decay, but some of the deep-rooted problems that led to the current fertile bed of discontent. Currently, divisions are becoming more entrenched and the glue that has held us together is in danger of dissolving. The country will face an enormous challenge to come together again after the dust of Brexit has settled. What is needed is a concerted effort to hold a dialogue at all levels that seeks to promote greater understanding between our vastly polarised communities. This dialogue can help articulate our common interests and priorities and propel visionary, progressive and implementable long-term change to build consensus across the UK. It can embed a political culture that is more relevant to the twenty-first century; connecting the people and the government, where voices at a grassroots level are heard and integrated into policy making.